We look back over the market in 3-month sections, and give you some insights that may be helpful. After all, the more informed you are, the easier it will be to achieve the best possible outcome for your situation. Blankinship & Foster team members have been interviewed by journalists from local and nationally recognized publications such as The New York Times, The Wall Street Journal, USA Today, SmartMoney, Financial Planning Magazine, Investment News, and the San Diego Union Tribune. As part of the ongoing planning and advice we provide, we’ll help you navigate the choices and make the best decisions for your situation. We can help you by addressing your questions, and proactively identifying issues and opportunities you might not have considered. Have you been through a divorce or the loss of a spouse? We have helped many women navigate major life transitions. In order to help you prepare for your future retirement, we've gathered a number of useful articles on a variety of subjects.. The great work we do comes from the roots cultivated by our founders, John T. (Jack) Blankinship and Charles Foster. Jack and Charles came from different backgrounds, but they shared the same passion for doing their very best for the clients they served, and for elevating the profession of personal financial advice and planning. When Jack Blankinship established Blankinship & Associates in 1974, the profession of financial planning was still in its early stages. The Certified Financial Planner (CFP) designation was still very new, and a movement to change financial planning to a true profession was gaining strength. It was a shift toward recognizing financial planners not as product salesmen, but as professionals providing important counsel on personal financial matters. Jack became an active proponent of this movement. Passionate about his profession, he focused on promoting the CFP designation and elevating the financial planning process. He was committed to adding a “fiduciary standard” to the CFP Code of Ethics. Charles Foster joined Jack in 1988, switching careers after many years of work in the high-tech field. He brought his experience in engineering and business, along with his dedication to serving clients in their best interests. 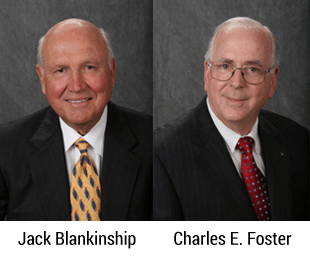 In 1989, the partnership of Blankinship & Foster was formed. Throughout the 1990’s Jack and Charles worked to improve the financial planning profession while growing their practice and serving their clients. Jack served as President of the Institute of Certified Financial Planners (ICFP) (which later became the Financial Planning Association), President of the Board of Governors for the CFP Board of Standards, and Chairman of the International CFP Council. Jack and Charles put together a team of professionals who shared their philosophy of client-centered services. In the early 2000’s Stefan Prvanov, Jon Beyrer and Rick Brooks joined the firm, became partners, and joined the leadership team. In 2010, with the leadership team firmly in place, Jack and Charles retired. Jack and Charles’s legacy continues through the present day. The leadership team has expanded with the additions of Teresa Kakadelas and Monica Ma, and our expertise in serving women and retirees has grown. Our staff has grown, and we are now a well-rounded group of twelve professionals. The financial planning profession has grown as well, with the addition of a fiduciary standard formally included in the CFP code of ethics. We are proud to continue the vision that Jack and Charles devoted their careers to making a reality. © Copyright 2019 Blankinship & Foster, LLC. All rights reserved. Do you know someone we can help?